The great debate in my soul the last few weeks is whether or not I would post this soup recipe. On a scale of 1-10, it’s probably like a 13.8 in deliciousness. On that same scale, though, it doesn’t rank quite as high in beauty. 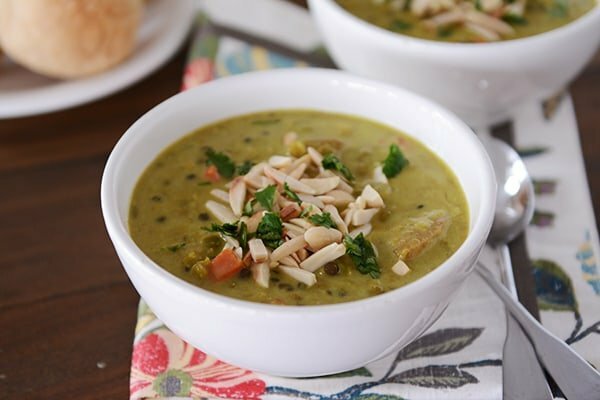 I’m not shallow enough to believe that all great tasting food has to look amazing (just glance through some of the archives of pictures/recipes I posted 8 years ago to see proof of that)…but…green soup has it’s limitations. I was finally swayed after hearing Brian ask me for the bazillionth time if I was going to post that “green lentil soup stuff” that has apparently become the only soup he wants to eat for the rest of forever. For a guy who will eat anything I make (unless it has cabbage, capers or horseradish), he has been unexpectedly poetic about this soup. Several remakes later (and after my Aunt Marilyn also made it a few times and raved), I figured you and I are good enough friends, I can post green soup and not land our relationship on the rocks. This soup really is wonderful. Really, really wonderful. The flavors speak to me. I love curry; combining its lovely characteristics into soup with lentils and beans and chicken sausage and a hint of vegetables should probably be categorized as its own love language. Brian really isn’t being dramatic. This soup is as good as he says and couldn’t be easier. Sauté, simmer, stir. Loaded with healthful, hearty ingredients, there’s so very much to be happy about – and please, for all that is wonderful and good in the world, don’t skip the suggested garnish of almonds (assuming you aren’t allergic, of course). In a 4- or 5-quart pot, heat the oil over medium heat and add the onion, carrots, celery, garlic, curry powder, salt and pepper. Saute for 4-5 minutes until the vegetables start to soften, stirring often. Add the broth and lentils. Bring to a low simmer for 20-30 minutes, stirring occasionally, until the lentils are tender (but not mushy). Stir in the sausage and beans and heat through. Stir in the heavy cream, if using. Taste and add additional salt and pepper if needed. The soup will thicken slightly upon standing. Serve warm with slivered almonds and cilantro. I feel like I'm a bit redundant about curry powder but I'll just say it again: my favorite curry powder is the Sweet Curry Powder from Penzey's spices. You can use any type of curry powder here (yellow, red, hot) just make sure you like the flavor as it will come through in the soup. Also, you can play around with the type of sausage used. If using an uncooked, crumbled variety, brown it first (before the vegetables) and remove to a plate before proceeding with the recipe (and then stir it in at the end with the beans). The color of the finished soup will largely depend on what kind/color of curry powder and lentils you use. I used a blend I found with red, black, yellow and green lentils. Also, scale back on the broth if you want an ultra-thick soup; conversely, add a few more cups if you want it to go a bit further and don't mind a thinner consistency. Keep in mind it will thicken a bit off the heat (after 10 or so minutes). SO, so yummy!! My husband was very pleasantly surprised and my 6 year old said that it was “Very good!”. The whole family likes it! I used hot Italian sausage (we like a kick to our food) and put in 2 T Mae Ploy yellow curry paste (we much prefer curry pastes to powders – we think they have a better flavor). This is going to be made monthly in our house! So happy you love this one! This is one of our very favorite recipes! We make it all the time and any time we’ve fed it to visitors they are surprised how delicious it is… and ask for the recipe. The toasted almonds are a must- part of the thing that makes this recipe so unique and delicious. Love this soup. And love Penzey’s curry. Thanks for the recommendation! LOVED this. So easy, so flavorful, and I had all the ingredients on hand. I love making lentil soup, but didn’t have a meat version. This will definitely go into the rotation. Thanks, Mel! Would you have any suggestions on how to cook this in an Instant Pot? I have made this re I’ve several times and love it!! I’d probably throw everything in there (except sausage and beans) and cook on high pressure for maybe 8-10 minutes? Then add the sausage and beans and heat through. Thanks! I’m trying it tonite!! I made this soup again this week, left out the sausage since our guests do not eat meat. I didn’t have any almonds on hand and I just went ahead and made it. Still delicious!! Thank you. So yummy. Thanks for another great recipe! And I definitely think the Penzey’s curry powder makes all the difference. I doubled everything except the broth. I only 1.5’d that. I like a thicker soup. I never have celery in the house, so I used some celery seed for flavor and put in 1/2 a cabbage, shredded. I used pre-cooked chicken sausages and removed the casings before cutting them up and adding to the soup. Before adding the lentils, I thought maybe there was too much curry. However, after the lentils were cooked, the overall flavor was excellent. Actually, I doubled everything and used 10 cups of water instead of 12. This was amazing! I used mild Italian pork sausage, which I first browned, then continued with the recipe as written. Although I like Trader Joes, I made a curry recipe that I didn’t like using TJ curry powder . I have been wanting to make this soup for awhile and I finally got some Penzeys’ sweet curry powder and made this lentil soup. It is delicious. I had to cook it a long time for my lentils to soften up- I think they were pretty old. This soup is so good! I love it!! It’s good also served with a scoop of brown rice in the bowl. I also added some baby kale at the end. Thank you! The flavor of this soup was fantastic. I quadrupled the amount of carrots but kept everything else the same, and it was great. Thanks all the way from South Korea! Love this soup! I have made it several times but this time I used ground turkey breast and seasoned it with some curry and salt and pepper while cooking it (not a big sausage fan). I usually don’t add the cream and it’s delicious but this time I used coconut milk (lite) and it is my new favorite variation! This soup was so so delicious! I love lentil soup and I’ve made your other lentil soup recipe as well , but I really liked this one. I used turkey kielbasa since I didn’t have chicken sausage and it was great! I was also out of fresh cilantro ,so I just stirred in some cilantro paste. It was absolutely amazing! I can’t wait to have the leftovers for lunch. You’ve done it again Mel!! We have tried two of your new recipes this week and both were a hit!! This soup was so yummy! My husband was skeptical when I told him it was curried soup but he couldn’t get enough. That shepherds pie was a huge hit!! I made it with ground turkey and would highly recommend. It was much less greasy than ground beef tends to be 🙂 we also had the salsa verde tostadas which were new to us. Loved them!! Thanks for helping me succeed with cooking 🙂 you are so talented!! Thanks!! Just made this Mel… only added some cumin and ground cardamom….just because I LOVE the aromatics. Also used Hot Curry… because we like it a little picante down here in Tucson. I used fully cooked Aidells roasted garlic and gruyere cheese sausage (because I had them and they needed to be used by today!) This soup…. is sooooooo yummy! 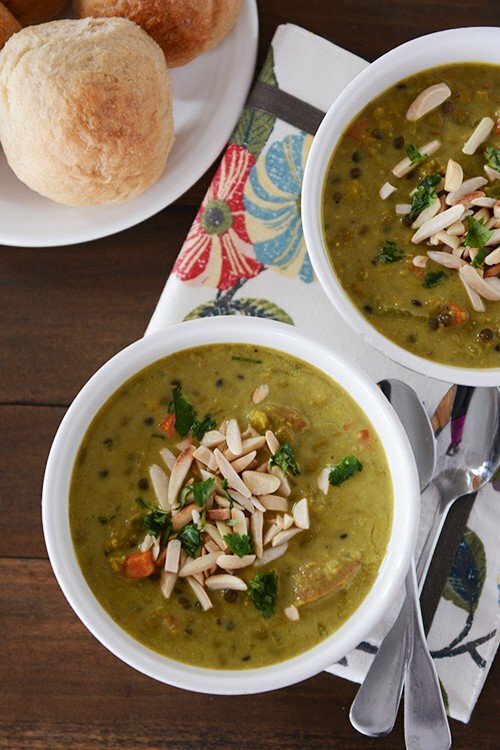 If you love lentil soup… use this recipe! Thanks Mel! Really enjoyed this soup! Even my non-curry loving husband loved it! Said it’s his 2nd fave soup after my black bean soup. Love how easy & healthy it was. I doubled the recipe so now looking forward to enjoying it for my lunches this week! Thank you for sharing the recipe! I have never eaten lentils at all, but I bought some recently. I’m 60 miles or thereabouts from Penzey’s in Orlando, but just about all my spices come from them. I’ll have to get the curry powder, and I will definitely try this. ‘Cause I trust you when it comes to recipes! What if I used coconut milk instead of cream??? My 4 year old and I ate this for lunch for 4 days…delicious! The next time I make it, I might add some canned coconut milk instead of the heavy cream. And, definitely don’t skip the almonds! Drove an hour today, to the nearest Penzey’s to buy the sweet curry powder. Looking forward to making this tomorrow after I buy the lentils and sausage. Can’t wait! Just made this tonight and it was so so great. We loved all the flavors. I used sweet Italian chicken sausage from Trader Joe’s and stirred in 1/3 c of Greek yogurt. Definitely on our “to make again” list. made this last night, it was really good…. cut the amt. of curry powder in half as my husband isn’t a huge fan but we both enjoyed it… I agree, don’t skip the toasted almonds… also, added a little cream but to me, it’s not necessary. will definitely make it again. Oh Mel, Mel, Mel. You know I am all over a new recipe from you. I got cancelled from work today, so I mixed up a triple batch of this, one for now, one for later and one for a friend. I wish I had made 6 of them as it will freeze just beautifully. I just sampled a tiny bowl of it and I wish I could chow down on a big bowl of it, but I made it for dinner. I have no idea why you think it is undesirable to look at. I think it is gorgeous! I chopped everything up so tiny and I am just tickled pick at the beauty of it. Penzey’s website was not working for me yesterday (and besides, I couldn’t wait that long for it to get to me to try it) so I used regular generic Kroger curry. I can’t wait to stop by Penzey’s to get the real stuff and try it that way too! It reminds me of one of my MIL’s meals that I love but with more uumph. (I will send you that one to try. It is a secret, but we won’t tell her.) Tell Brian we all said thanks for getting your fingers in gear and getting it on here for us! OK. Revision. I just put it into a clear freezer bag…and NOW I get it. I won’t say anymore, but now I understand why you almost didn’t post this. (insert big, cheesy and knowing smile.) BUT it totally rocks my kitchen and my world…and again. RockStar status. Gracias. Hahaha! That made me laugh. Glad you know what I mean. And I will look forward to that recipe! This recipe came at a perfect time. I was home on a snow day and trying to scrounge something up for lunch since my hubby had also been snowed in from work. I had most of the ingredients on hand and it was a perfect solution to my lunch problem. Warm, tasty and my hubby even tried to lick the bowl. Thanks for the wonderful recipe! OMG! I have never commented on one of your recipes before even though I have enjoyed so many. But after finishing this delectable meal (along with your french bread rolls) I was compelled to tell you how much I loved it! I was craving soup with a lot of flavor and this certainly fit the bill. Thank you for sharing! Even got the kids to eat lentils so it was a hit for my teenagers too. 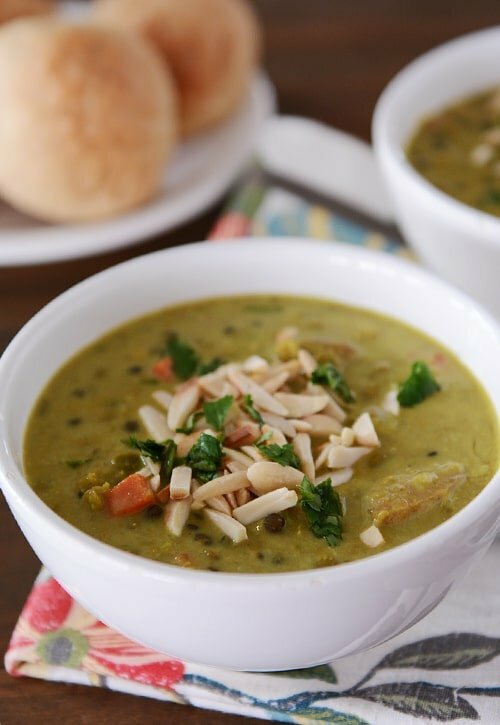 A great wintry soup which helped me forget it feels like summer here in California! Thanks for trying it so quickly, Lynn! And for reporting back…so glad it was a hit! I’ve never been a big fan of curry…however, I think I need to give it another try and see if I my tastes have changed. I’ve found over the years many things I thought I didn’t like wasn’t true any more. Many are now my favorites. This looks wonderful! Thanks for sharing. I am going to take the plunge and order some of the sweet curry powder from Penzey’s. Do you have any other favorite spices that you order from there (I am trying to meet the minimum purchase for free shipping)? I never want to live without their Vietnamese cinnamon! It is so sweet you could use it for cinnamon toast almost without any sugar. It lets me cut the amount of sugar needed for most things, which my diabetic hubby greatly appreciates! 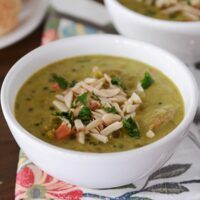 This sounds a bit like mulligatawny soup (there are a million versions, but the one I like uses chicken and coconut milk instead of the cream, and also includes a grated apple). It looks and sounds so strange, but is absolutely wonderful. Even picky eaters seem to like it. yum! Mel, have you ever made navajo tacos. we made them last night and so easy. you make indian fry bread, 4 ingrediants, thats it. top with meat, pinto beans, cheese, you name it. an idea for you. Mel, I happen to despise curry powder, but I’ve only ever tried the one found at most grocery chains. Now I’m curious if Penzey’s would turn me into a fan. Do you think it’s different enough? Hmmm, that’s a good question, Andrea. I’m not sure – it’s definitely still curry but the flavor is a bit different than any I’ve ever tried. Do you think it’s just the general curry taste you don’t like? Do you like garam masala? I’m allergic to cardamom, so I can’t have garam masala. I do like cumin, if that’s similar. I love Penzey’s! I’ll put this soup on my menu for sure. Thanks Mel! I don’t have much experience using curry powder. I also have a 2 year old. What type of curry powder would you recommend for someone new to curry with a semi-picky toddler? I don’t know how he different colors translate to taste. Thank you! Hi Jessica – that’s kind of why I like the Sweet Curry powder from Penzey’s – it isn’t quite as spicy as other brands. If you don’t have it (and don’t want to mail order it), I’ve also liked the Spice Islands brand (but I’d probably stay away from their Hot Madras Curry powder and go with their regular one). I get my curry from the bulk spice section at Winco or at a locally owned produce and grocery store with a HUGE selection of bulk spices. Then you can just buy a few Tbsp at a time until you decide what you like! Bulk spices are very economical compared to spices bought in small jars. This looks really good. I have everything except chicken sausage. I have some smoked sausage I’ll use and will not use the cream (we are trying to lose some weight so that should offset the fat in the sausage). I love lentils and make a very plain, vegetarian version that my mother used to make when I was a child before vegetarian was even a word – LOL. We will have this tonight for dinner. I love your recipes. They are some of the best I’ve found on the web! This looks so delicious! Where do you buy your favorite curry powder? Thanks for your many amazing recipes! @Lucy – Mel posted in the notes above that she gets her curry from Penzey’s Spices. You can buy online or they do have a few retail stores in the U.S. Thanks for the reply, Julie. I couldn’t find it on Amazon, so I’ll have to try buying directly from Penzey’s. Not going to lie, kinda like the color 🙂 Beauty is in the eye of the beholder! We love soup and we love lentils. I’m sure this will be a hit! I have everything on hand! Perfect for dinner this week! we love the lentil soup at a middle eastern restaurant around here. I bet this would be similar to that. @carla – I haven’t made this soup but I think a chicken apple sausage would taste really good in this. Wegmans, a grocery store, makes a curried chicken apple soup which is out of this world delicious so the sausage you mention reminds me of the flavors in that soup. Like a chicken apple sausage would be ok or should something plainer be used? I think I have everything to make this so it might find its way to our table on Wednesday! Hey Carla – yes, I think a chicken apple sausage would work great. I’ve used a pineapple bacon one and also just crumbled sausage, too. It’s very adaptable.